Once and again people ask me the question "what is the most important thing in landscape photography?". Of course, this question cannot be answered unequivocally due to the many ingredients of a good picture - but there is no doubt that light is one of the essentials of many good pictures. Light widely determines our technical approach and puts it's basic mood over the scenes. It defines intensity, models the subjects and is often the main motif by itself. I took this collection of four pictures of the same iceberg around the end of May 2013 on four different occasions over several days (altogether there were even 5 variants, but 4 are better arrangeable in one picture). 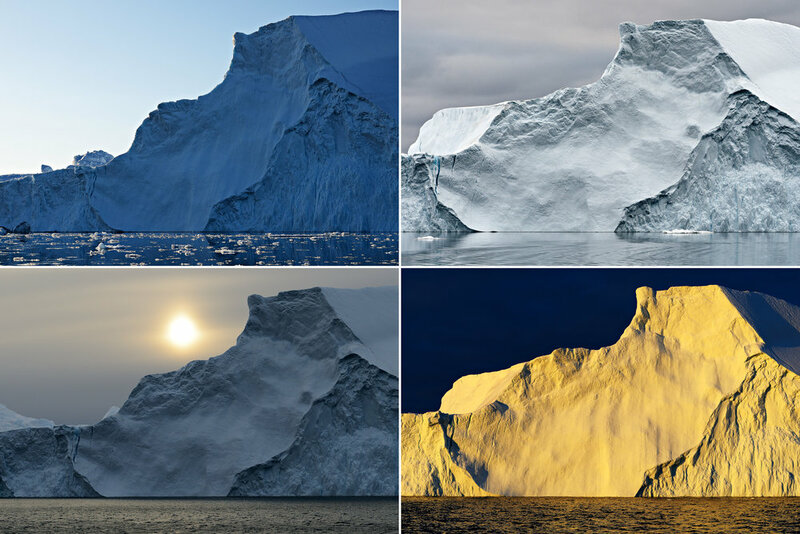 It was only at home that I discovered, that the pictures showed almost exactly the same section of an iceberg in different lighting situations - so diverse was the effect of the position of the sun and the weather as well as the rotation and position of the slowly drifting iceberg relative to the sun. On the upper left you can see afternoon backlighting with amber-coloured ice fragments on the water surface, on the upper right there is the typical mercury light of the Arctic when the sky is overcast, on the lower left the night sun hides behind a cloud bank and finally on the lower right there is the unbelievable light of the midnight sun shining below a dense cloud cover, which makes the ice shine like gold when the sky is dark. It is, by the way, not the first time this has happened to me - from such series I have concluded that my inner compass for image aesthetics seems to provide reproducible results in a certain way, since in different lighting situations I unconsciously chose the same characteristic image framing several times. On the one hand, this sounds good to me - as I can assume that my compositions are not purely random products. On the other hand, it makes me ask myself the question whether I did not reproduce myself by selecting a section, just like a predictable photo robot. However, I have to postpone the clarification of this question, as I haven't given it enough thought yet. After all, I am satisfied with the result of the comparable image frames inasmuch as that they look somewhat aesthetic in each of the light situations and on the other hand clearly show the different effects of the image component "light". Gedanken zu fotografischen und anderen Themen. Ich flieg’ einfach schnell mal hin!